Using Salesforce Chatter email notifications are monumentally important for anyone who wants to successfully use Chatter as a business communication tool. In Part 1 of this blog post I explained why email notifications are important and how they can drastically reduce the number of overall emails that you receive and/or have to respond to. Now that we can (hopefully) move past those common objections, I will reveal how I manage my Chatter email settings & notifications to ensure that I a) stay engaged and b) don’t miss anything important. I’ll go into more detail about each of these below. Almost all of these are enabled for me, with a few of exceptions that I’ll make a note of in a minute. But for the most part, if you disable these notifications you will not see posts/comments directed to you that would otherwise be sent to you via email, and eventually the people who posted these will be forced to send you an email with the same content. Best to not waste their time (or yours) and make sure you get these. *This will work for most users; exceptions are those in the organization who have particularly high visibility (i.e. executives) and will gain high volumes of new followers, likes, and comments. If you’re an executive, think carefully about what is most important (the bottom section) and keep as much of the “mandatory” settings as you can handle. The strategy I describe below works for me, but could very well be tweaked and remain just as effective. I recommend this strategy as a starting point, and once you are accustomed to it you can tweak it to make it work for you in whichever way you need. Ultimately you should define and commit to a likes/bookmarks strategy. Likes: I will like posts/comments not only to indicate that I actually like something, but perhaps more frequently to acknowledge receipt, i.e. let the author know that I read what they have to share. (This can be a powerful tool – think about the difference between seeing a post with 0 likes and a post with 20 likes… the post with 0 likes makes the author wonder if anyone saw it.) However, many of the posts that I “like” are congratulatory or are a discussion thread that I have no interest in or time to participate, so I’ve disabled notifications for “Comments on an item I like” so that I don’t receive endless, redundant, and/or irrelevant comment notifications. Bookmarks: I use bookmarks to subscribe to – or “follow” – conversations, particularly those in which I have not yet participated (i.e. commented). If I receive a Chatter email notification with a new post and I want to make sure I am tuned in to the responses, I simply bookmark the post (often by replying to the email notification with “Bookmark”) so that I automatically receive notifications when someone responds. If the conversation gets to a point where I am no longer interested, I can simply remove the bookmark and the notifications disappear. The beauty of this is that no one else can see when I bookmark/un-bookmark conversations, so I don’t risk offending anyone by “unsubscribing.” Using bookmarks this way is basically a hack for following/unfollowing threads (like in Facebook). If/when Salesforce Chatter releases a comparable feature, I will likely shift how I use bookmarks. I also recommend receiving a daily personal digest on a daily basis. 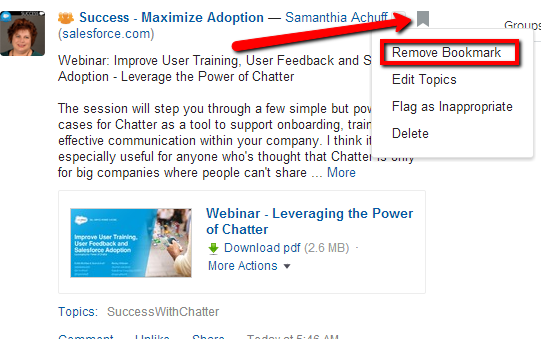 There are a number of areas in Salesforce where we can use Chatter but we cannot receive notifications (such as record feeds, other user profiles, and topics). It can be a challenge to keep up with these during the day, but your Personal daily digest will capture all of these conversations so it’s worth scanning every morning to make sure you haven’t missed anything. 4. 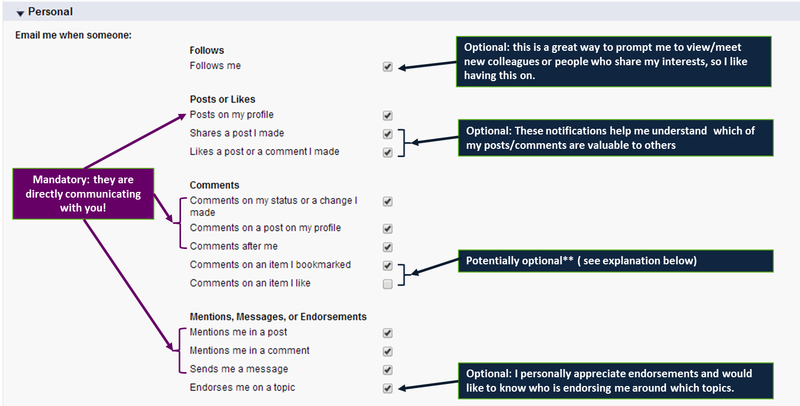 Set ALL of your Group notification settings to “Every Post” or “Never” – this is important!! Chatter group email notifications seem to be a huge pain point for so many people, and in many cases it’s because of one simple issue: they elect to receive daily digests for each individual group in which they are a member. This causes inbox chaos every morning if you’re a member of more than a few groups (which most of us are). Remember that your personal daily digest will capture your group activity as well, so it’s redundant to also receive daily digests for individual groups. To make the most of group email notifications, you should opt to receive notifications on “Every Post” or “Never,” period. Chatter Groups are generally focused around teams, projects, initiatives, or on topical areas of interest. As a consultant, ALL of my project teams use Chatter rather than email to communicate throughout the day and with our clients, so it’s important that we are all seeing these conversations as immediately as they happen, otherwise Chatter would not be an effective email replacement. However, there are other groups that I am a part of in my company that are interesting, but not critical to my projects or daily activity (such as some of our Partner groups or interest areas). For these groups, I never receive an email notification but I will see posts from those groups in my feed and in my personal daily digest, which is perfect. 5. Set your “Default Setting for Groups I Join” to “Every Post” – this is arguably the most important step of this strategy! If you find that it is completely irrelevant or uninteresting, instead of changing the email notification setting to “Never,” use this as a prompt to leave the group entirely! If you remain a member of a group like this you will be adding “noise” to your Chatter feed. And remember you can always view public groups as a non-member or join private groups later. Annnnd that’s it! Just five easy steps that will change your Chatter experience entirely. You’ll be more engaged, more productive, and you’ll quickly become a new type of leader in your organization. I promise you that this overall notification strategy technique will go so far in helping you manage what you see in your Chatter feed. And if it doesn’t, I would love to hear why and what you do to fix it! If you have another second to spare, let me know what you think of this strategy in the poll below! 2. Bookmarks, strategic likes, and filtering into your feed. These are GREAT suggestions – thank you so much!! I would love to focus on these and will add them to my list. Do you apply this same strategy to the Salesforce Success Communities? Or is this specific to your internal org’s Chatter? If you’re using Chatter in a community, you have a subset of these tools in the email notification settings. Also, I like it when community managers use email marketing tools to periodically update community users on hot topics, recent conversations, and curated content. This has proven to increase engagement. Good question, Amy! I apply the exact same strategy to all orgs I am a member of, including the Success Community. As I said in a previous comment, my WordPress notifications were going to spam so I missed this last year 😦 With that said since it’s been some time, have you had an opportunity to put this strategy into practice? Curious for your experience! I did implement your suggestions and found they work well for our internal chatter feed. For my success communities, I found I was spending too much time reading email with “every email” checked. I left one community set to every email and changed the rest to weekly digests. Now that I think about it, there’s one that I will probably change to daily digests. Ah, okay – interesting! Thanks for sharing. 🙂 I definitely don’t have “every post” on many groups in the Success Community because the volume is just too large. I’ve found that having my success community personal digest set to weekly is working better than daily + weekly group digests. I have a ? about replying to posts with ‘Bookmark’. Is this custom code? Do you need to put this in the subject line? Nope. Bookmarks are core Chatter functionality. Thank you for another informative site. Where else may I get that type of info written in such an ideal method? I’ve a challenge that I’m just now working on, and I’ve been on the glance out for such info. that you make. Detailed Oriented-A wedding photographer needs to focus on tiny details so that you cannot miss to capture the important moments of the wedding. If you want to obtain a good deal from this article then you have to apply these techniques to your won web site. What’s up, the whole thing is going perfectly here and ofcourse every one is sharing data, that’s genuinely good, keep up writing. Totally agree, Brad! Aside from the manual steps we can take, the Einstein engine should be a huge help to this end. Great, glad to hear it! Thanks! I like the idea of communicating with other members of the company. It is a lot like FB but allows you to gain knowledge or get help.